Vietnam is enjoying record numbers in shrimp exports but ironically faces tough barriers in its home market. Shrimp accounted for 46 percent of Vietnam’s total seafood exports in 2017, raking in US$3.8 billion out of US$8.3 billion worth of aquaculture exports in total. In 1Q18, shrimp exports brought in US$719 million in revenue. Over the next decade, shrimp exports are expected to represent as much as 75 percent of total aquaculture export turnover. However, local retailers are subject to safety regulations on permissible levels of chemical and antimicrobial residues found in their products. The use of some of these chemicals in aquaculture is permissible by law and must not exceed maximum residue limits (MRLs). However, some substances though permissible in one country, may be banned in another. The use of these “banned” substances are regulated by minimum required performance limits (MRPLs). This represents levels low enough to be considered negligible and having no effect on consumers’ health. The Vietnam government has not issued any MRPLs for shrimp. Thus, products with less than 0.3 parts per billion of chloramphenicol may be acceptable to markets such as the European Union (EU), Japan, and South Korea, but will be banned outright in Vietnam’s supermarkets. This poses a problem for shrimp producers and supermarkets as they negotiate prices and supply for the upcoming Tet festival next year. Deals are usually concluded in September. The Vietnam Association of Seafood Exporters and Producers (VASEP) engaged the Ministry of Agriculture and Rural Development (MARD) late last year to resolve this issue but was directed to the Ministry of Health. In September, the Food Safety Agency under the Ministry of Health redirected the issue back to MARD as it involved the MRPL and not MRL. Intensive shrimp farming in Vietnam involves clearing away large tracts of mangrove trees to create tarpaulin-lined ponds of brackish water. After every harvest, wastewater is often discharged into the waterways without treatment, and replaced by water pumped up from the same waterways. This contaminated water must then be chemically treated to remove organic matter. Antimicrobials and supplements are added to keep the shrimps healthy. A paper in the August edition of Public Health Reviews listed major public health issues related to antimicrobial residues. These include the development of antimicrobial drug resistance, hypersensitivity reaction, carcinogenicity, mutagenicity, teratogenicity, bone marrow depression and disruption of normal intestinal flora. “Indiscriminate use of antimicrobials in aquaculture… requires control measures to ensure consumer protection,” wrote the authors. The United States (US) and European Union (EU) ban the use of antibiotics that are also used for humans due to the risk of antimicrobial resistance. Disease-causing bacteria that can survive these antibiotics will be harder to treat when they infect humans. “Antibiotics have no place in shrimp aquaculture. The risks presented, in terms of consumers, in terms of the spread of antimicrobial resistant pathogens, far exceed any benefit gained from unfettered access to cheap shrimp,” noted John Williams, executive director of the Southern Shrimp Alliance, an association representing the US’ domestic shrimp industry. The overuse of antimicrobials impacted India, the world’s biggest shrimp exporter. The EU inspects 50 percent of each batch of shrimp imported from India and has threatened to ban future imports. This became a windfall for Vietnam as it also enjoys preferential tariffs from the EU. In 2017, the EU became the largest importer of Vietnamese shrimp, with a turnover of US$867 million. However, Vietnam is not completely in the clear even if its shrimp exports comply with the EU’s MRPL. In Japan, every shrimp shipment from Vietnam is sampled, instead of the usual practice of 30 percent. South Korea has issued two letters to Vietnam regarding the presence of nitrofurans residues in its shrimp. In April, the US government added shrimp and abalone to its Seafood Import Monitoring Programme (SIMP), which imposes stricter requirements on record keeping to track produce from point of harvest to import. Vietnam’s shrimp producers must comply with SIMP by 31 December 2018. 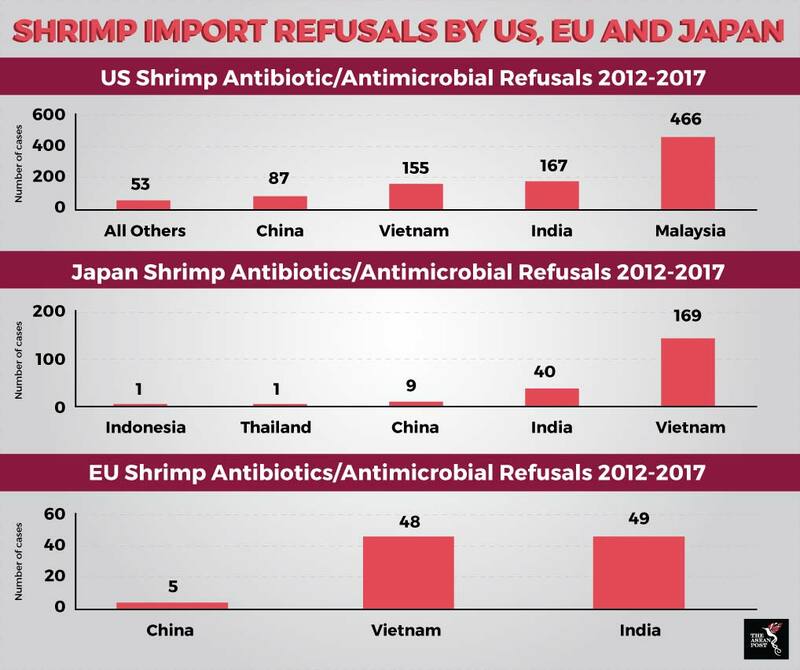 Vietnam’s shrimp exports to the US have been declining since 2017 due to anti-dumping duties levied by the US. In March, the US Department of Commerce announced a revision of duties to 25.4 percent but lowered it further to 4.6 percent in September. In efforts to curtail antibiotic residues and impurities, the business community has intensified their oversight, said Truong Dinh Hoe, general secretary of VASEP. This has led to higher prices and production costs, which erode customer confidence, he added.